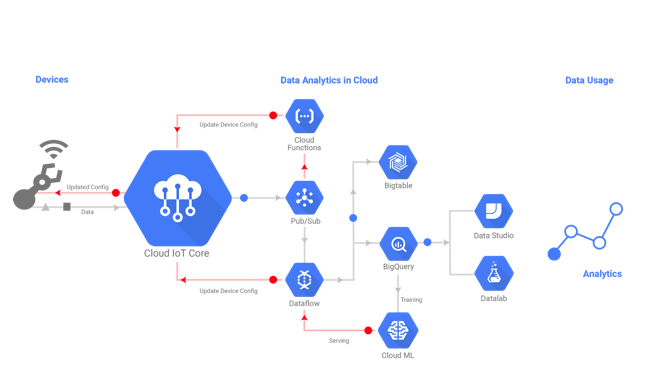 Google Cloud launched a new Internet of Things management service today called Google Cloud IoT Core that provides a way for companies to manage IoT devices and process data being generated by those devices. A transportation or logistics firm, for example, could use this service to collect data from its vehicles and combine it with other information like weather, traffic and demand to place the right vehicles at the right place at the right time. By making this into a service, Google is not only keeping up with AWS and Microsoft, which have similar services, it is tapping into a fast-growing market. In fact, a Google Cloud spokesperson said the genesis of this service wasn’t so much about keeping up with its competitors — although that’s clearly part of it — it was about providing a service its cloud customers were increasingly demanding. That’s because more and more companies are dealing with tons of data coming from devices large and small, whether a car or truck or tiny sensors sitting on an MRI machine or a machine on a manufacturer’s shop floor. Just validating the devices, then collecting the data they are generating is a huge undertaking for companies. Google Cloud IoT Core is supposed to help deal with all of that by removing a level of complexity associated with managing all of these devices and data. By packaging this as a service, Google is trying to do a lot of the heavy lifting for customers, providing them with the infrastructure and services they need to manage the data, using Google’s software services like Google Cloud Dataflow, Google BigQuery, and Google Cloud Machine Learning Engine. Customers can work with third-party partners like ARM, Intel and Sierra Wireless for their IoT hardware and Helium, Losant or Tellmeplus for building their applications. While the company bills itself as the more open alternative to competitors like AWS and Microsoft Azure, this IoT service is consistent with Google’s overall strategy to let customers use both its core cloud services and whatever other services they choose to bring to the process, whether they are from Google itself or from a third party. The solution consists of two main pieces. First there is a device manager for registering each of the “things” from which you will be collecting data. This can be done manually through a console or programmatically to register the devices in a more automated fashion, which is more likely in scenarios involving thousands or even tens of thousands of devices. As Google describes it, the device manager establishes the identity of a device and provides a mechanism for authenticating it as it connects to the cloud, while maintaining a configuration for each device that helps the Google Cloud service recognize it. The second piece is a “protocol bridge,” which provides a way to communicate using standard protocols between the “things” and the Google Cloud service. It includes native support for secure connection over MQTT, an industry-standard IoT protocol, according to the company. Once the device is registered and the data is moved across the protocol bridge, it can flow through processing and eventually visualization or use in an application.